Check us out on Public Access Television! Sunday, Monday, Wednesday and Saturday at 7am! 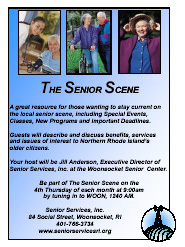 Tune in to WOON 1240AM from 9:00am-9:30am and listen to ï¿½The Senior Sceneï¿½. This program is a great resource for those wanting to stay current on the local senior scene, including special events, classes, new programs and important deadlines. 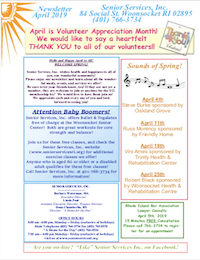 Guests will describe and discuss benefits, services and issues of interest to Northern Rhode Islandï¿½s senior citizens. by tuning in to WOON, 1240 AM. Check out the Senior Scene!